Fumes from diacetyl, used to create butter flavor, may be hazardous to your lungs. You wouldn’t think microwave popcorn could kill. Hundreds were sickened after inhaling diacetyl fumes at popcorn manufacturing plants across the country. 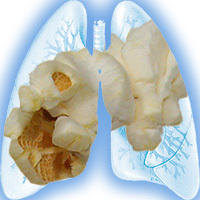 Many developed a potentially debilitating lung disease called bronchiolitis obliterans, better known as “popcorn lung.” Some have died from it. The U.S. is encouraging some employers to conduct regular surveillance of potentially fatal occupational lung diseases. In a guidance document released in March, OSHA and NIOSH recommend the use of spirometryÂ (PDF) as a surveillance and early-detection tool for respiratory hazards. The announcement followed years of controversy over diacetyl, a compound used by microwave popcorn manufacturers to create butter flavor. “More and more companies are becoming aware of their hazards and the effects they can have on their employeesâ€™ health and ultimately their bottom line,” said Craig Mellock, Director of Product Development at American Industrial Medical. Spirometry is a common pulmonary function test (PFT) that can help monitor changes in lung function over time in hazardous occupational environments. Changes in lung function can signal the need for personal protective equipment, such as a respirator, and for improving work environments. 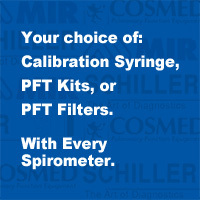 Free calibration syringe, PFT Kits or PFT filters. A-M Systemsâ€™ role in helping companies implement a successful monitoring program is to provide them with necessary equipment. From spirometers and viral-bacterial filters to nose clips and mouthpieces, these products are required and certified to meet the OSHA/NIOSH guidelines as well as the standards set by ATS and ERS. Mellock, whose company provides on-site health screening, believes a growing number of companies are proactively monitoring employeesâ€™ health. The new guidelines offer employers a road map and a checklist for setting up an effective, spirometry-based screen and surveillance program. In a separate leaflet, OSHA also informs employeesÂ (PDF) that spirometry tests may be required every 6 months to 3 years depending on the types of exposure hazards at work. The controversy over diacetyl and its substitutes (2,3-pentanedione) has forced the National Institute for Occupational Safety and Health (NIOSH) to develop a national standard for exposure maximum and surveillance requirements. In a draft standard posted last month, NIOSH recommends diacetyl exposure be kept below five parts per billion during a 40-hour work week. At that level, a worker has a 1 in 1,000 chance of suffering reduced pulmonary function as a direct result of diacetyl exposure. This involves developing a medical monitoring program that includes spirometry testing for pulmonary function, medical evaluation for workers found with abnormality on spirometry, removal from exposure pending this evaluation, and analysis of medical surveillance and spirometry data on a group basis (epidemiologic surveillance) to assess work-related risk factors based on job, task, area, and other exposure indices. The purpose of epidemiologic surveillance is to assist monitoring physicians in prioritizing and evaluating the effectiveness of interventions, if indicated. Identifying excessive declines in spirometry, even within the normal range of spirometry, offers the best opportunity to intervene to prevent the development of impairing occupational lung disease. Companies should seek the advice of experts in complying with workplace safety standards, according to Mellock. As a certified sprometry tester, on average,how many done in a week?